The preservation and promotion of history — Monmouth Beach and beyond — is a great trust. History once gone can be most difficult to recapture. Credit goes to these borough residents for their steady work at verifying our past. • Rosemary O’Brien — She matters eminently in Monmouth Beach annals as the author of the first official historic account of this amazing seashore community. Published in 1975 in conjunction with the borough’s upcoming celebration of America’s Bicentennial, the publication remains popular today. It’s a very thoughtful chronicle of borough yesteryear in a compact 32-page booklet. Known as a stalwart fact gatherer and clear writer, Rosemary researched and also penned histories of the MB School and Precious Blood Church. A busy mother of six, she launched and edited the first official borough newsletter in 1977. A final admirable contribution to borough heritage came with her service as the treasurer of the MB Historical Society, when that group championed the cause to save the old life saving station in 1999 (now the popular MB Cultural Center). Savvy at business, she managed one of the borough’s oceanfront high-rises for years and also owned the MB Cleaners on Beach Road. A MB School PTA president and resident since 1964, she died in 2007. • Daniel Hennessey, Jr. — When there’s talk of classic photography on Monmouth Beach, Dan Hennessey’s name should come up quickly. A 50-year borough resident, Dan not only had a virtuoso’s eye with the camera, but he also possessed the goodness to share his enterprise with generations of borough residents. Many of the public photos of historic Monmouth Beach either he took or were part of his extensive collection. A North Long Branch native, Dan was a founding member and president of the MB First Aid Squad and a borough fireman. His father, Daniel, Sr. was the longtime train station master just across the borough’s border in North Long Branch beginning in 1907. Back in those days, the Central Rail Road of NJ rolled through MB and LB along Ocean Avenue. For 40 years a respected photo man at EAI (once a spot of groundbreaking computer technology, then located at the north end of Long Branch Avenue), Dan and his wife Gloria raised five children in town. He died in 1988. 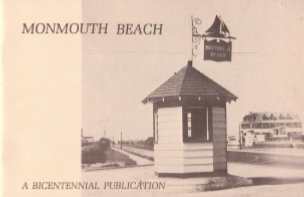 • Sam Smith — A Monmouth County historian of some repute, Samuel S. Smith was also a longtime borough resident who helped to record and advance Jersey Shore history. Sam was the author of some of the best-regarded books on the American Revolution. He was a recognized authority on the Battle of Monmouth — a pivotal American-British conflict in June 1778. 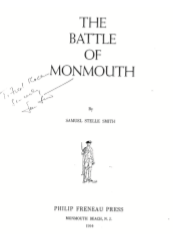 His 1964 book, The Battle of Monmouth, was considered the gold standard on the clash. He’s also credited with “pinpointing” the well used by Molly Pitcher that hot and fateful day. He wrote books about military action in Trenton, Princeton, Brandywine, and in Delaware during our war for independence. His collection, which included maps, deeds, accounting records, published histories, newspapers, and other sources, is now part of the Monmouth County Archives. Sam was also one of organizers of the borough’s grand American Bicentennial celebration in July 1976 (helping to ID centennial homes). By profession a calculator company executive, he died in 1989 at the age 85 still pondering history. 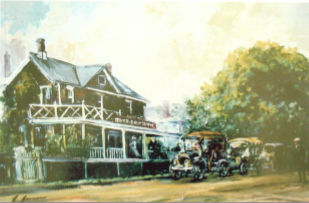 “Riverdale Hotel” by Gail Gannon. • Gail Gannon — The borough is fortunate to have the telling eye and able hand of Gail Gannon, our artist-in-residence. Much-admired for her chronicling of old-time Monmouth Beach through her historic paintings, Gail is a 60-year resident of the borough. Inspired by friends and the teachings of Ida Libby Dengrove (the Emmy-winning courtroom illustrator for NBC-TV News), Gail began her oil paintings of borough scenes in the 1960s. Her talent for capturing numerous iconic borough images is unmatched. She and her husband, Jack (a charter member and president of the MB First Aid Squad), raised four children in town. Winning photo by Pat Maney. • George V. (Pat) Maney — Known to be among the more dedicated patrons of Monmouth Beach history, Pat was born in 1901 and lived in town until his 1977 death. In the early 1940s, he won an amateur photo contest sponsored by the New York Herald Tribune (known as the “newspaperman’s newspaper”). 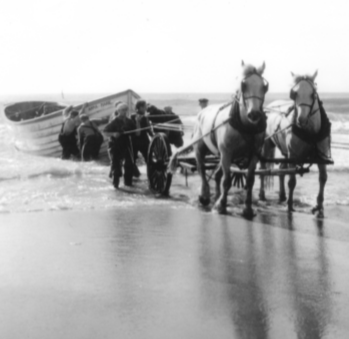 His entry, a truly iconic borough photo, was a shot of a massive Galilee pound fishing boat (the Anna Marie) being hauled onto the beach by a team of horses and fishermen. Admirers say Pat took many fine borough photos and had an ample memory for meaningful borough events and people during its first century. He was also a dedicated public servant. Starting out as a motorcycle officer, Pat served parts of four decades in the MB Police Department, capping off this career as borough police chief from 1955 to 1964. He also served as chief of the MB Fire Department in 1936 (his dad, John A. Maney, was the first MB fire chief in 1908).